Now That, Is What I Call A Party! The location was in a major downtown hotel in Washington DC. The "Take it!" was not difficult at all. The challenge came in comprehending what I was actually seeing. 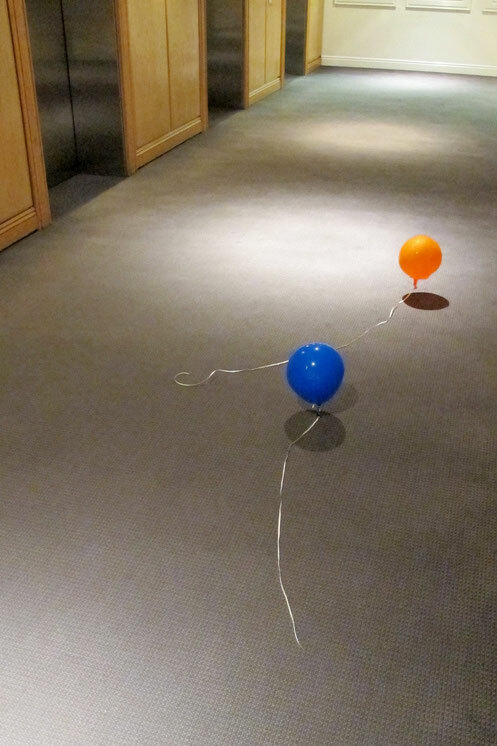 Here were two ballons situated just in front of the elevator doors, in the lobby, just inches off the floor. They were obviously on their last legs with their tether like ribbons stretched out behind them. The overhead light provided the illumination for the shadow underneath each of them to verify the hover effect. They looked like a couple making their way out of the hotel on their way home. The After Take: The universal reaction to the photo was one of almost a disbelief in that it was there to be captured. A reaction that was fully in sync with my own when I first saw them. It was great to be in such harmony with the viewer, and to be able to express how this was the case. So often, I have photos that call for explanation and this is what I seek, with the qualification that the explanation must not take long to relate. Another shared experience. Thanks for the smile this may have brought to you. If only they were Red. still reminds me of the song 99 red balloons anyways. Ha! How had I not seen this photo yet? Must have missed a day. Two burn't out balloons leaving that killer party I see.